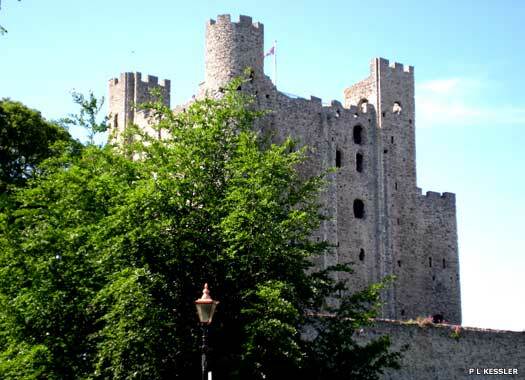 Rochester Castle is strategically placed on the London Road, the route from Canterbury and Dover to the capital, and it overlooks the right bank of the River Medway, commanding a wide view of the surrounding country. 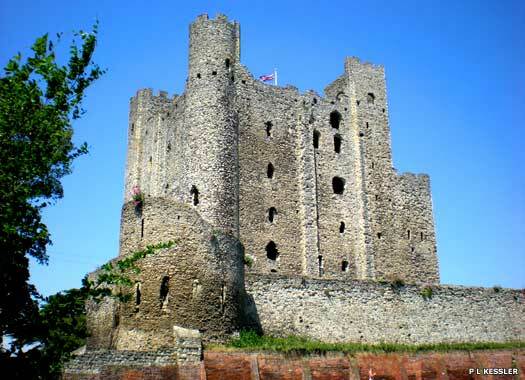 Almost as soon as they had landed, the invading Romans established a military presence at Rochester in AD 43, but it was the Normans who were responsible for the castle, building it within the Roman city walls. A motte and bailey keep was probably built on the site immediately after the Norman Conquest, and it would have been this that was used as the headquarters for the rebellion against William II which wanted to remove him in favour of his elder brother, Robert, duke of Normandy. William captured the castle, not once but twice, ending the rebellion on the second attempt. 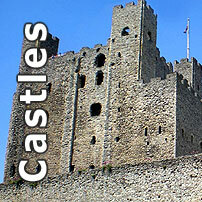 He requested that Gundulf, bishop of Rochester, rebuild the castle. 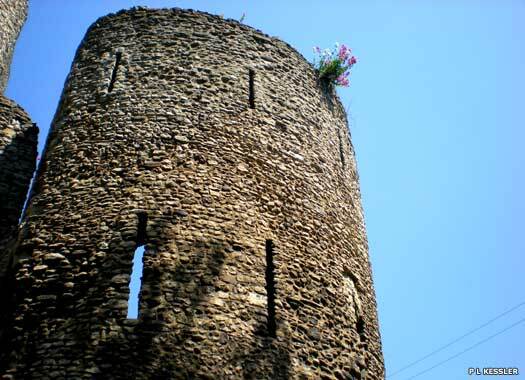 Gundulf did that between 1087-1089, making it one of the first stone keeps in the country. He also worked extensively on building the neighbouring Rochester Cathedral, and played an important role in building the White Tower in London. In 1126, Henry I granted the castle to William de Corbeil, archbishop of Canterbury (1123-1139). He immediately started work on rebuilding it, producing what would become one of the finest relics of its kind in England. 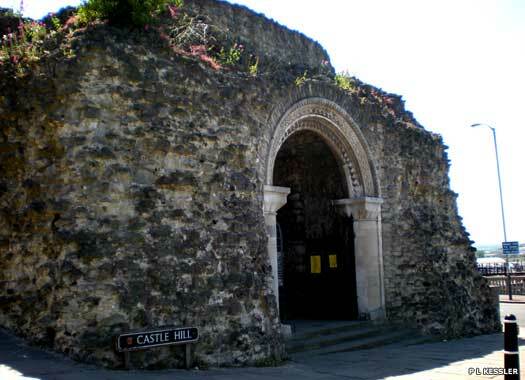 The quadrangular four-storied structure, flanked by turrets, was made of Kentish ragstone, with a maximum height of 34.4 metres (113 feet). 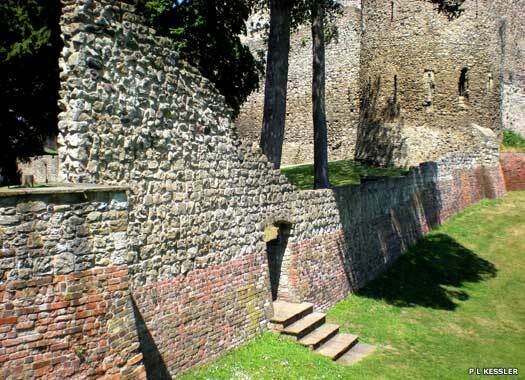 It consists of three floors above a basement, and attached is a tall protruding forebuilding, with its own set of defences which any attackers would have to pass through before the keep itself could be entered at first floor level. 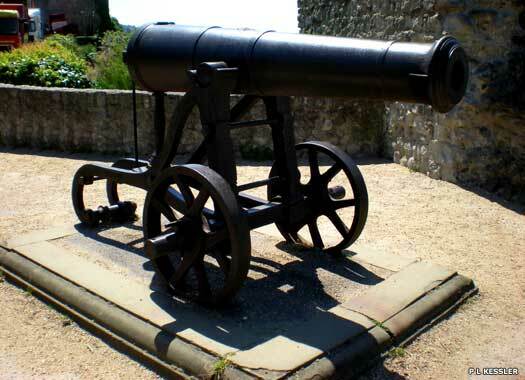 It was put to the test in 1215, when it was besieged by King John. 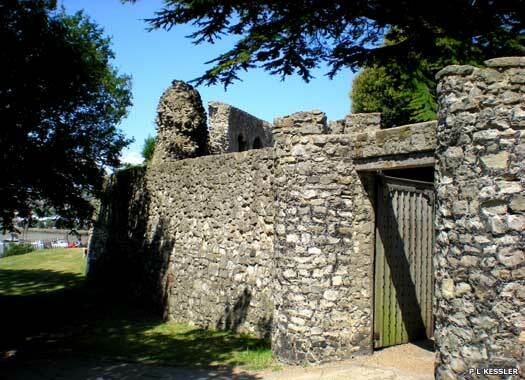 At that time the castle, seen here from the south and showing the curtain wall, was garrisoned by rebel barons in the lead-up to the signing of Magna Carta. Having first undermined the outer wall, John used the fat of forty pigs to fire a mine under the keep, bringing its southern corner crashing down. Even then the defenders held out within the building, until they were eventually starved out after a resistance of nearly two months. The castle was besieged again by Simon de Montfort, during the civil war between his party of rebel barons and King Henry III. 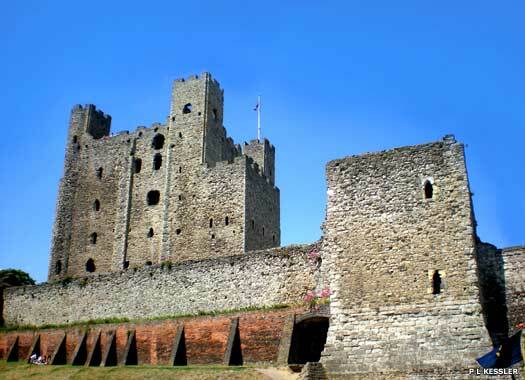 Rochester was held for the king by the constable, Roger de Leybourne, and the siege began on 17 April 1264 after Gilbert de Clare, earl of Hereford and Gloucester, attacked the city from the south-west. On hearing of Gilbert's approach, the Royalist garrison fired the suburbs towards Canterbury. Meanwhile, Simon de Montfort approached from London to attack the city from the northern side via the Medieval bridge across the River Medway. At first, de Montfort's army was beaten back at the bridge, but at the third attempt on 18 April, Good Friday, he succeeded in crossing. A simultaneous assault was launched by Gilbert de Clare from the southern side, and the two earls entered the city the same evening. Much destruction and killing took place within the city. 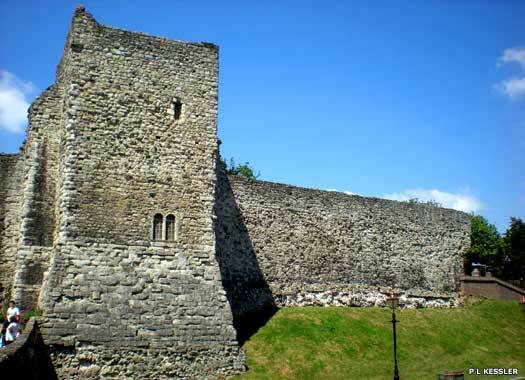 The next day, both de Montfort and de Clare's forces entered the inner bailey of the castle, to the south-east of the bastion shown here, with the garrison beating a hasty retreat to the keep. Both earls renewed their attack using siege engines and the castle took a constant battering for over a week before they had to withdraw. After the conclusion of the siege, Henry rebuilt the castle. It was besieged for a third time in the reign of Richard II, during the Peasants' Revolt led by Wat Tyler in 1381. 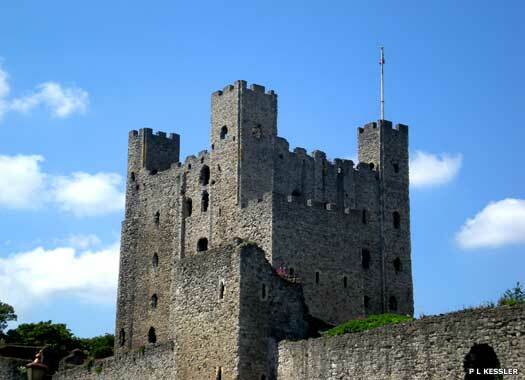 By this time the castle had reached its maximum military strength architecturally, and between 1383 and 1393 the bridge across the Medway was completely rebuilt in stone. The new bridge was built about fifty metres to the north of the Medieval bridge, taking it further away from the castle. The castle was repaired by Edward IV (1461-1470, deposed and then regained the throne between 1471-1483). By the sixteenth century the castle was falling into decay, although the massive keep remained in a good state of preservation. Remains of the thirteenth century walls which once surrounded the city also exist, although the remains of the Medieval bridge were removed in 1857, even though it took a charge of gunpowder to do it. The castle grounds were converted into parkland before 1891, while the gardens were cleared to make an open space for the 1931 pageant. Pageants, fairs, and special events are held there to this day.